That’s what we’re after most days of the week and something tasty too and perhaps a little bit different from what we normally serve. If you have children they may or may not have a liking for smoked food and I’m afraid that is a prerequisite for the success of this dish on your dinner table. I don’t know how mine acquired a liking for all things smokey, achieved here using smoked paprika and they’re also huge fans of smoked cheese – not one of my favourites. This recipe requires very little preparation and will be on the table in the length of time it takes to roast baby potatoes, which in my oven is 25 to 30 minutes. There is no peeling required and you can hardly call cutting up chorizo chopping so it is really, really easy. What makes it so delicious is the amazing ‘Bravas’ sauce which is from one of Lorraine Pascale’s cookbooks – Fast, Fresh and Easy Food – published in 2012. Here I’m serving the sauce over the pork instead of over the potatoes as in Patatas Bravas. I like to blitz the tomatoes in the food processor before cooking for a smoother sauce. Get the oven on to preheat good and high to around 200 C fan oven/ Gas Mark 7. Spill the potatoes onto a baking tray, drizzle over some rapeseed oil and use your hands to roll the potatoes around so all sides are glistening with oil. 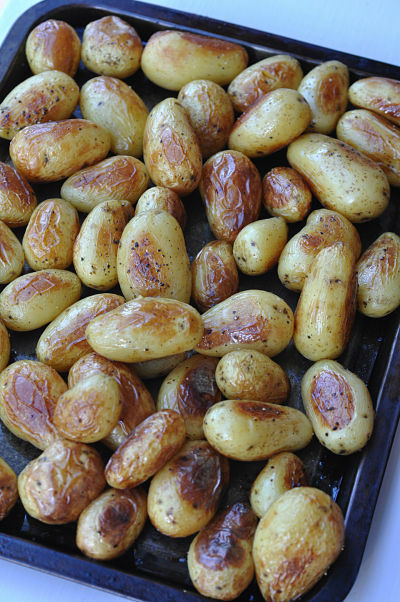 Season with some sea salt and black pepper and put the tray of potatoes on to roast. Heat a little oil in a large frying pan on a high heat and sear the pork chops on either side for around 2 minutes a side just to colour them nicely. 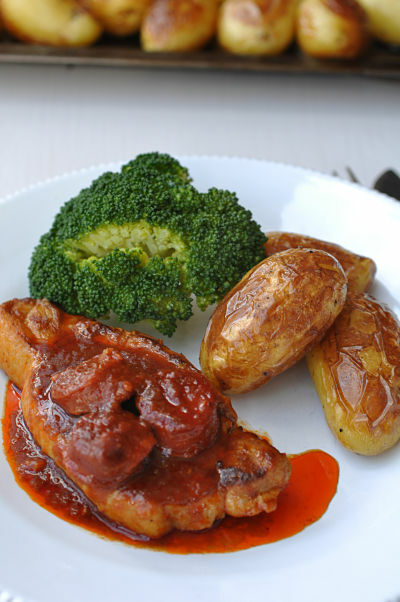 Pop the chops on a baking tray and place into the oven while you prepare the ‘Bravas’ sauce. Blitz the tomatoes in the food processor for a smooth consistency and then place in a large sauce pan over a medium heat on the hob. Add balsamic vinegar, smoked paprika, caster sugar, a drizzle of oil, salt and pepper to the sauce and bring to the boil and then reduce to a simmer for approx 10 minutes. Remove the pork chops from the tray in the oven and add them into the saucepan of simmering sauce to cook for another 10 minutes. Cut the chorizo sausage into bitesize chunks and add to the sauce, leave to cook and heat through for another 5 minutes. Test the potatoes after 20/25 minutes of cooking with a knife and once the knife can slide easily to the centre they are cooked and ready to serve. 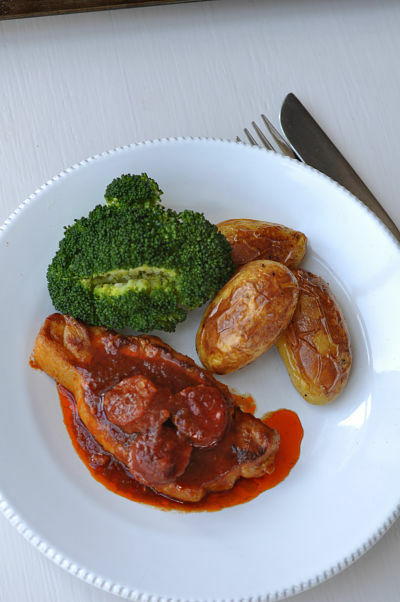 Serve the roast potatoes with some green veg such as brocoli or green beans alongside a pork chop smothered in the ‘Bravas’ sauce.